Throughout the course of one year, the average person receives an impressive amount of data. 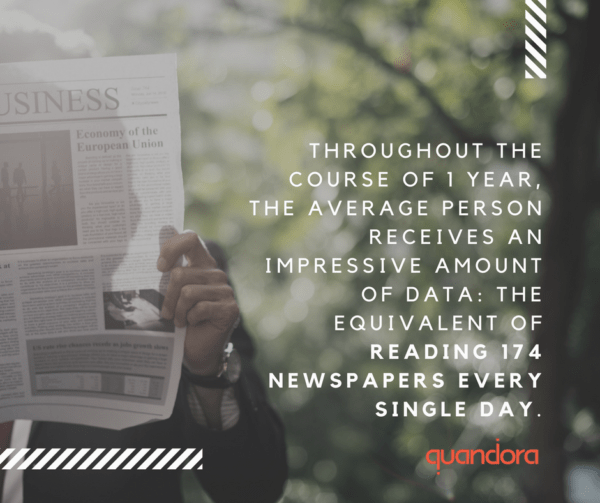 According to David Derbyshire, scientists have even figured out the exact amount we’re talking about: the equivalent of every person in the world reading 174 newspapers every single day. This overload of data people are dealing with increases the importance of knowledge sharing within an organization. Knowledge sharing is essential for a company to achieve success, since it can facilitate decision-making capabilities, build learning organizations (through a learning routine) and finally, stimulate cultural change and innovation. Still, overall performance in a company improves just when people do things differently, according to a study published by the Ivey Business Journal. Once you develop an effective solution to an issue and it turns out to be the best one so far, it allows members of your organization to use it in all future situations. Avoiding redundant effort by managing knowledge properly, saves a lot of time and budget – not to mention that it can significantly streamline work and keep employees’ morale up. Knowledge sharing also improves communication among employees, both intradepartmental and interdepartmental, according to “The Benefits of Knowledge Management: Some Empirical Evidence” study. The members of an organization can improve their relationship significantly by sharing and managing knowledge properly, no matter if they work in the same or different departments. When customers are facing problems or you have to solve an internal issue, analyze trends, understand competition or plan new strategies, you tend to look for information and resources in order to support such activities. Information overload can make this process difficult. However, using knowledge again and again in repositories allows decisions to be based on the actual experiences of the members in your organization. All these tasks can be performed efficiently if it’s easy to find what you need and, most importantly, when you need it. Most businesses have the main purpose of increasing revenue, but this can be a bit difficult when competition increases. By managing knowledge properly, employees gain access to valuable information and deliver better results. The organization stimulates innovation and, directly, achieves growth a lot easier. Customers appreciate a company that can demonstrate its widespread expertise and the ability to use it in their benefit. Also, the ability to deliver on time is essential and can help a company differentiate itself among its competitors. Sharing knowledge and innovation can definitely reduce the time required to deliver a product or a service, which results in increased win rates and, of course, satisfied customers! Know-how is another important asset in each company and it should be exploited and managed properly. Through knowledge sharing, organizations can capture explicit and tacit knowledge and eventually reduce their losses. You can find more information on this subject in these 2 articles we wrote about deep smarts and how to manage and keep your company’s deep smarts. It’s also a great way to make scarce expertise widely available to the entire organization. Classic tools like forums, training events, presentations, white papers, etc did the job before, but more dynamic and peer-to-peer centered knowledge sharing Q&A platforms are making information more easily accessible now.